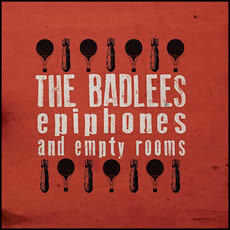 With their latest release, Epiphones and Empty Rooms, The Badlees have fully embraced the “two states” of their group. In fact, they have taken this concept to the extreme with a double album made of two discs which are intentionally distinct from each other. Each disc was mixed and mastered through different methods and on different coasts, making the entire package more like two simultaneous album releases than a traditional double album. The contrast between the pop-oriented, modern sounding “side A” and the earthy, Americana, roots-based “side B” runs far deeper than the surface fact that each features a separate lead vocalist. Side A, which features the band’s traditional front man Pete Palladino on lead vocals, was mixed by Dave Goodermuth and mastered by Jeff Reeves at Masterdisk in New York City. Side B features the Badlees primary composer Bret Alexander on vocals, was mixed by Joe Alexander in Los Angeles, and mastered by Alexander and band mate Paul Smith back at Saturation Acres studio in Pennsylvania, where all the material was recorded. When we reviewed the Badlees previous studio release Love is Rain in 2009, we noted how that album was a melding of the two styles in one fine masterpiece. In contrast, this double album is a total separation with the only common link being the musicians themselves and Alexander’s compositions. Which style is better is really just a matter of personal taste. So, in order to give a fair and honest review of the album, we will be reviewing disc separately and assessing each for its own merit rather than making constant comparisons between the two.